Sonos is a wireless home sound system that can fill home with music, room by room. 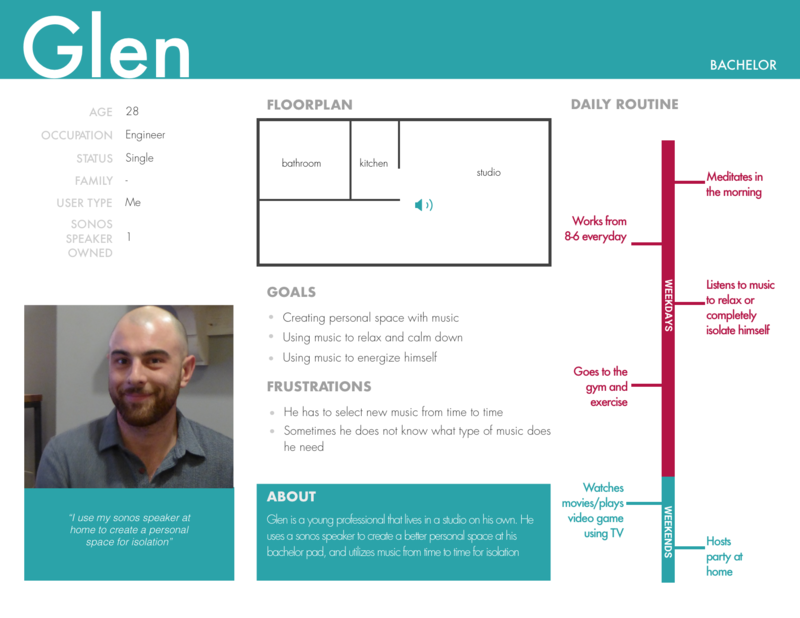 With years without major design update, the task time required for users to navigate within the app and get to play music in the desired room is still significantly long. There is room for improvement for UX design in the way users control their Sonos speaker. My manager gave me a particular task to look into improve music scheduling on Sonos speakers, as some users expressed the want to schedule music on their Sonos speakers in advance. 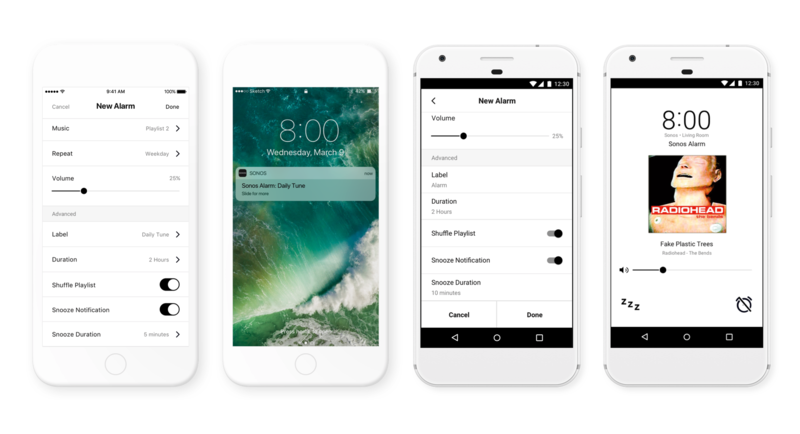 A new app controller design is introduced and shipped to improve navigation as well as time to music with new UI & UX design of the iOS and Android app. On one hand I did a redesign of their Settings page to improve navigation experience. On the other hand I pushed for immediate improvement in Sonos UX with redesign the existing alarms page to improve existing scheduling experience. I also focused on the task given by my manager and refine the problem statement after solid research. Then I proposed future designs of touch points including wearable, mobile and hardware interaction to solve the real problems users were facing. The team came up with a new design to improve navigation and time to music with an updated information architecture in new tabs navigation design to simplify navigation. A new "My Sonos" tab is also introduced, which serves as the home tab for users with good organization of different favorite content. 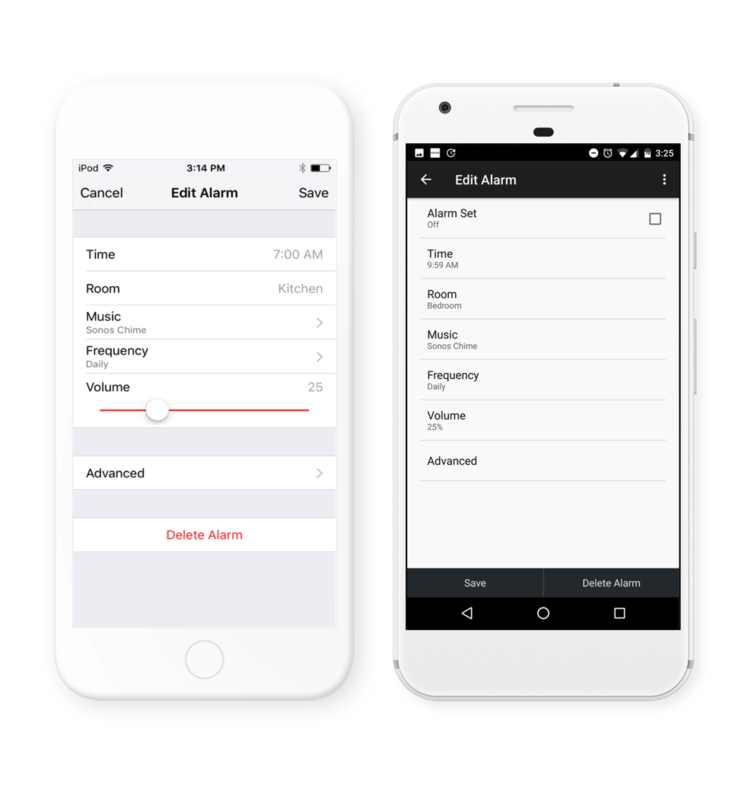 As we studied the usability issues of the previous app, I came to discover a number of issues with Settings and Alarms (now moved under the more tab) . 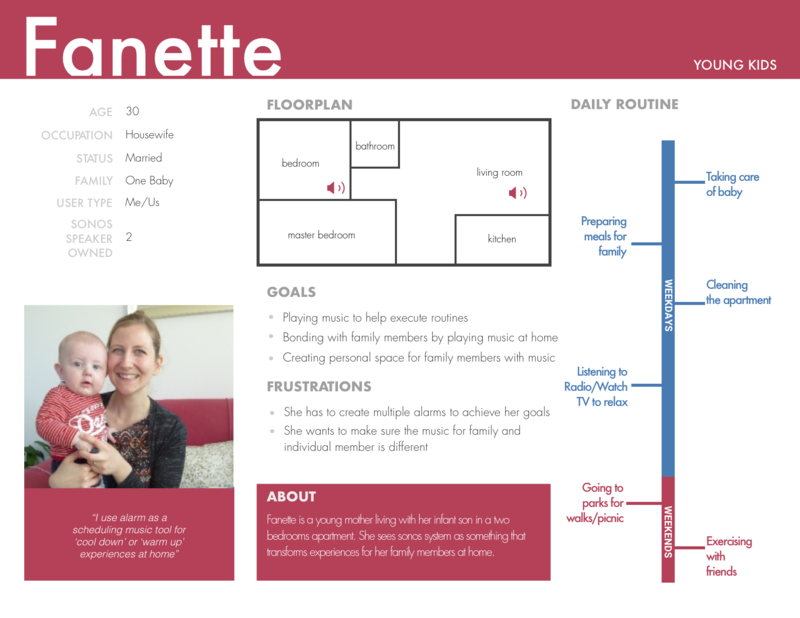 Users can easily feel lost in those two pages with yet-to-improve information architecture such as long running list, less frequently used items being placed on top of list...etc. I started redesigning those two pages. 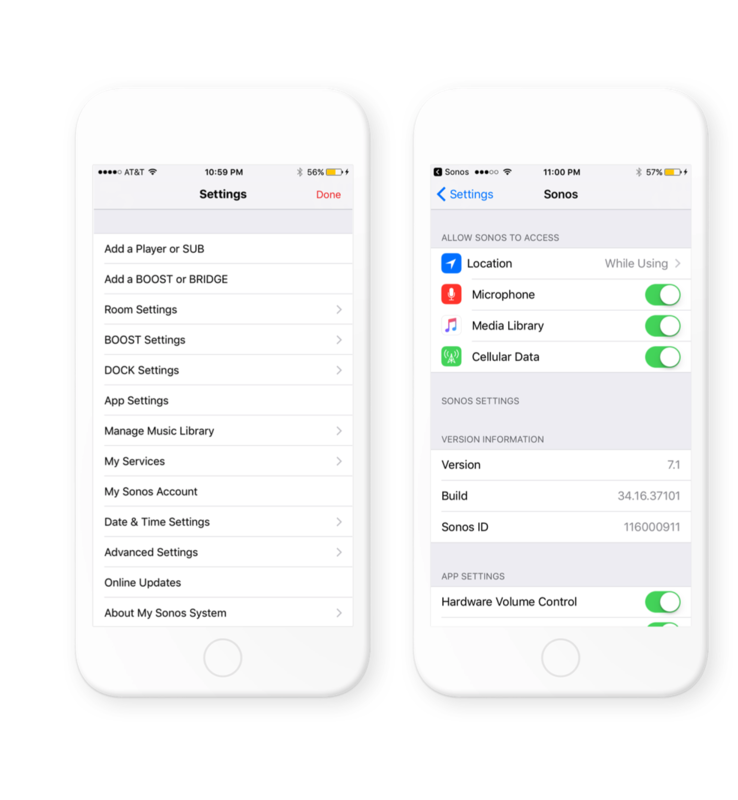 Here are some of the screens from the updated design of Settings. 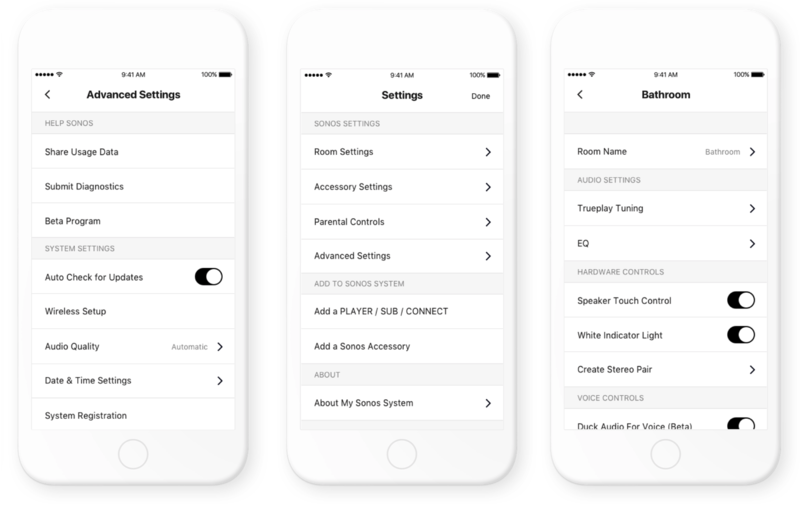 Not only is the IA cleaned up with better organization supported by user data, the UI design is also updated to respect the new Sonos UI library pattern. Users want to schedule music to be played on their Sonos speakers to improve their time to music but fail to do so. Design a solution to address that. I started looking into the area of music scheduling. As I reviewed research done by researchers at Sonos and conducted 5 contextual inquiries myself, I realized the alarms page has been used by Sonos users as a "hack" to schedule music. Yet there are a number of issues in the existing design creating frustrations in use. Therefore, I decided to focus on improving the alarms experience first to make sure existing users using the alarms for scheduling can have a better experience immediately. 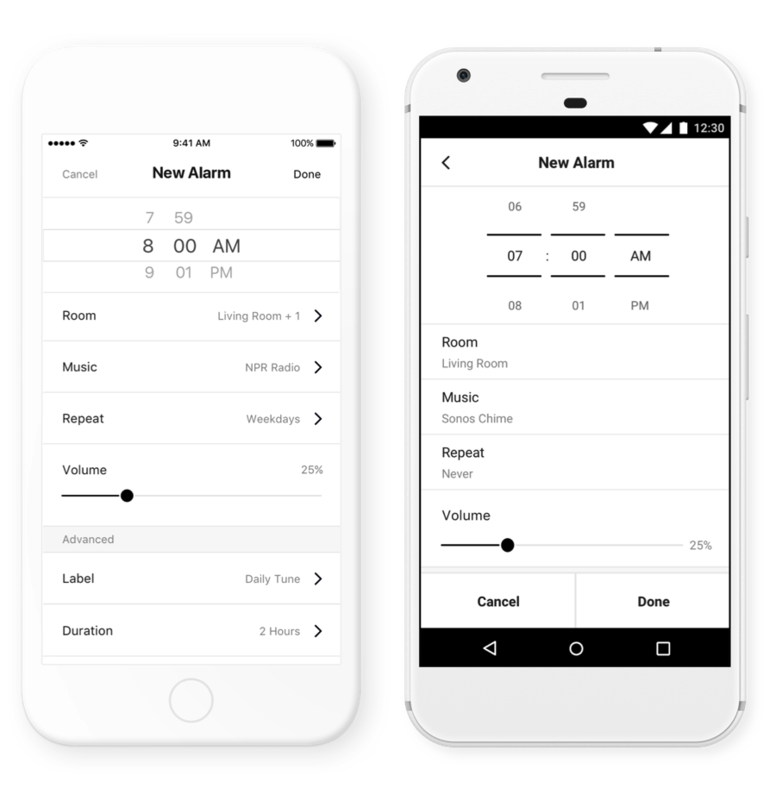 Not only does the new design improves IA as well as UI design of the alarms page, it also improves the UX by providing an actual alarm experience with notification for users to dismiss/snooze the alarms immediately. 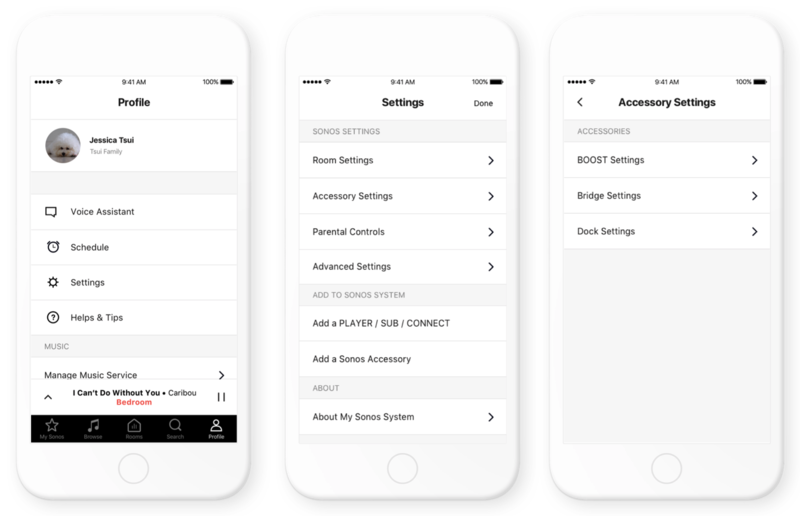 Together, the redesign of Settings and Alarms provide a better and more consistent user experience for Sonos users. As I was given the task to solve the problem of "improve music scheduling for Sonos users as they are struggling with it", I wanted to see what I can do other than improving the alarms to improve music scheduling experience for users immediately. Therefore, I decided to take a deep dive into understanding how are users using Sonos and what are the pain points they are struggling with. When I was working on the project, the only way for users to control the content being played on the Sonos speaker was through the app controller. I did a contextual inquiry with 5 users trying to understand the number of steps needed for the task - listening to music on Sonos and the pain points users are encountering. 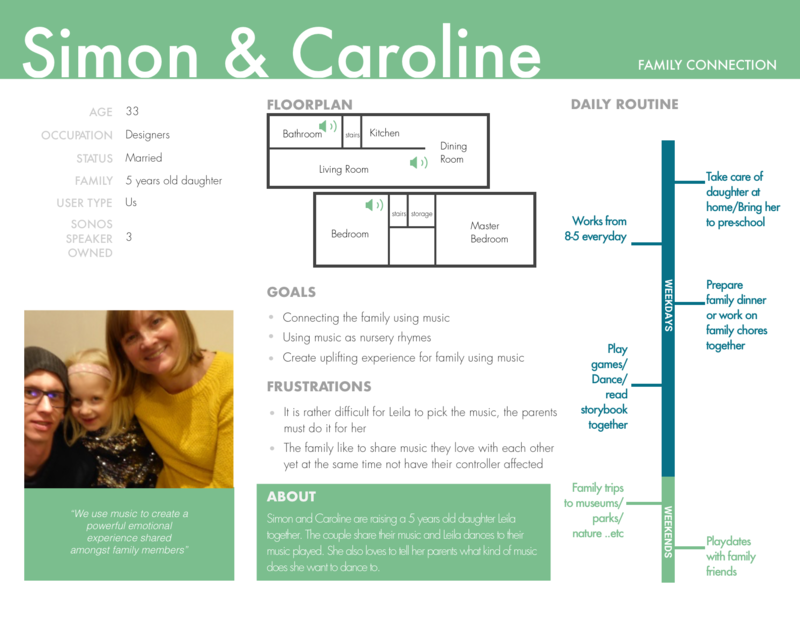 I then synthesized the findings from my own research as well as other previous research findings from other team members from Sonos into personas so that I can understand the goals and frustrations of the Sonos users better. While Sonos brand the Sonos experience as something as simple as "Pick a Song, Pick a Room, Hit Play", it is actually not as easy and simple as it sounds. 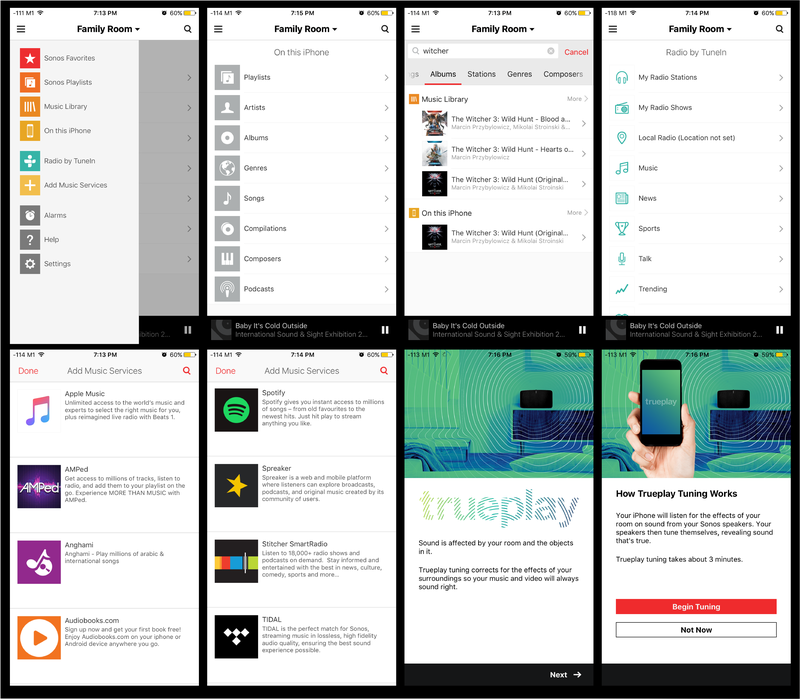 It requires multiple steps for users from recognizing the need to play music to actually finding the content they want and play the music on a Sonos speaker. 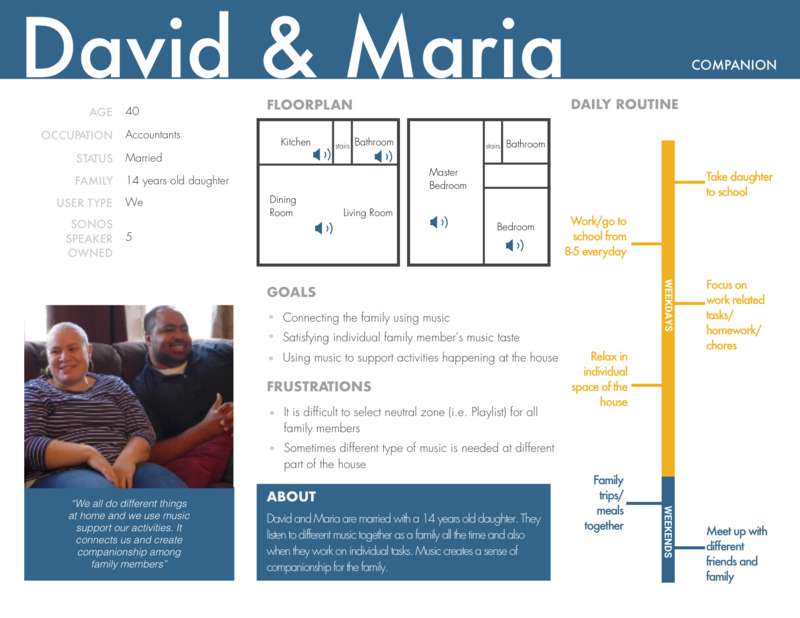 In order to empathize with the users and understand their needs better, I used qualitative data provided by researchers at Sonos to form the following personas and identify the key users' need. By using these few sets of data, we can tell what kind of music is needed by users in a certain area at a certain time of the day easily. As users are easily overwhelmed with the choices available, an experience designed to anticipate when and what the users want can help to minimize the cognitive load for users. 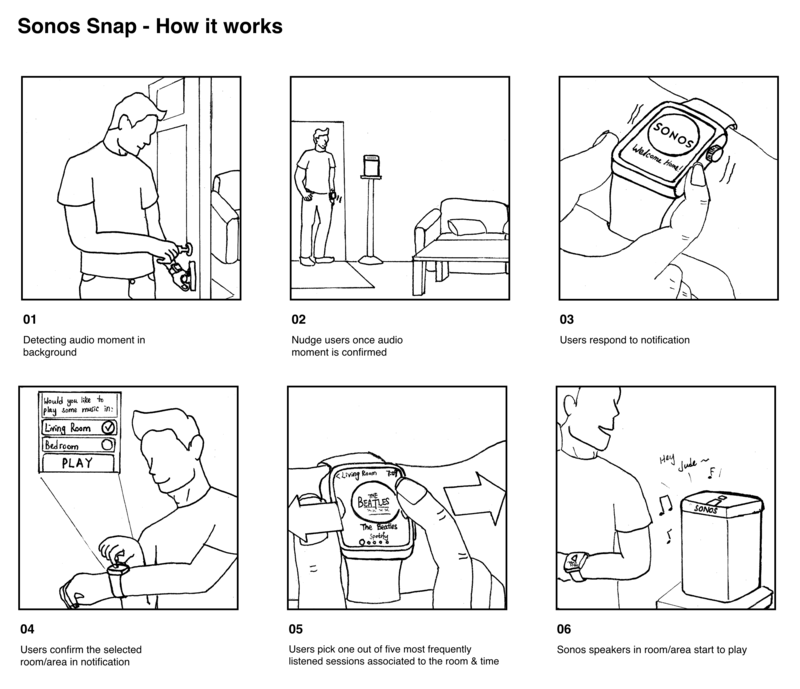 Therefore, the design aims to detect potential audio moment - moment where music is needed. 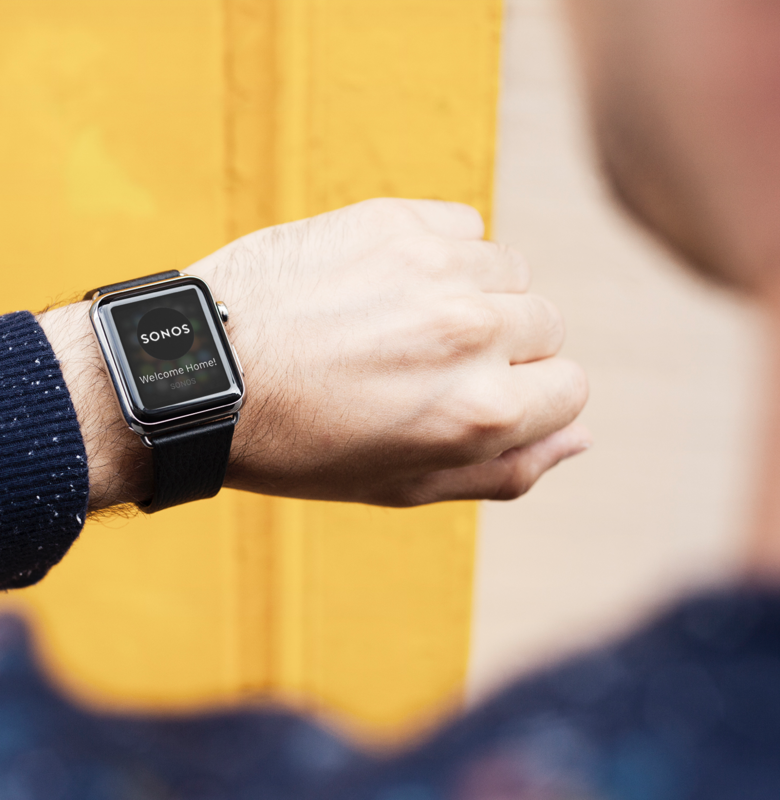 With the audio moment detect, we can provide users with a few sessions of their favorite music. 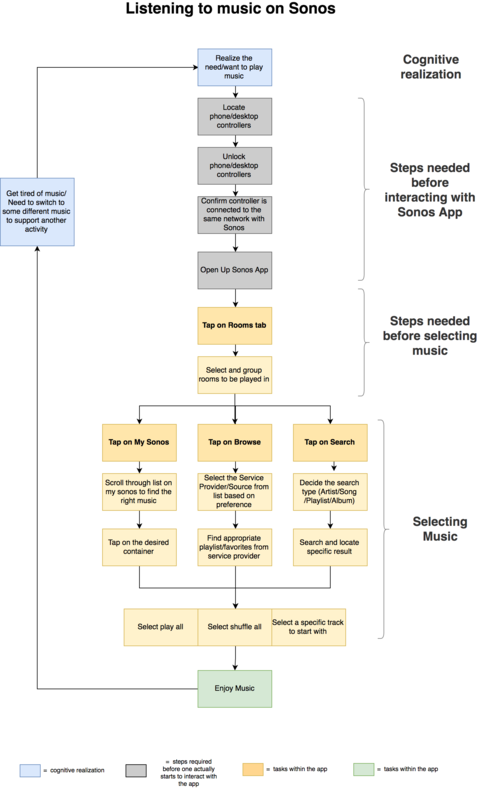 With this new experience designed, it is anticipated that the number of steps required for users to complete the task to play music on Sonos speaker will be drastically reduced as the diagram illustrated as below. 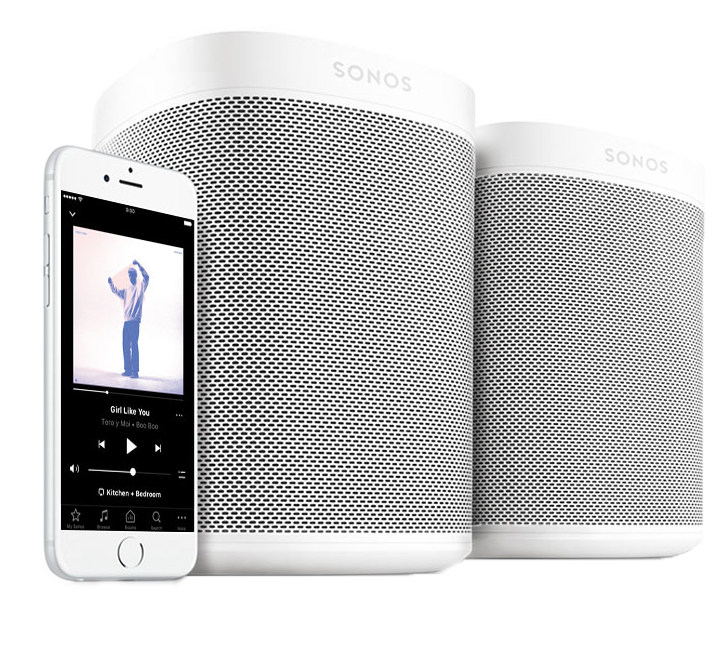 It is expected that the ease of use, the satisfaction of use as well as time to music will be improved for users, and ultimately creates an even better Sonos experience for users. This is the first time I work in cross functional team setting. It is definitely exciting to have a lot of other team members to help to realize the designs and make the product even better. At the same time, it also taught me an important lesson to communicate with other stakeholders thoroughly so that we can prioritize designs and define MVPs to be shipped for users. Working in sprints is definitely exciting. Seeing your designs come in live and available for testing within two weeks is great, because it gives designers and the product team an opportunity to learn from mistakes fast as well. With problems identify early, we can iterate fast. 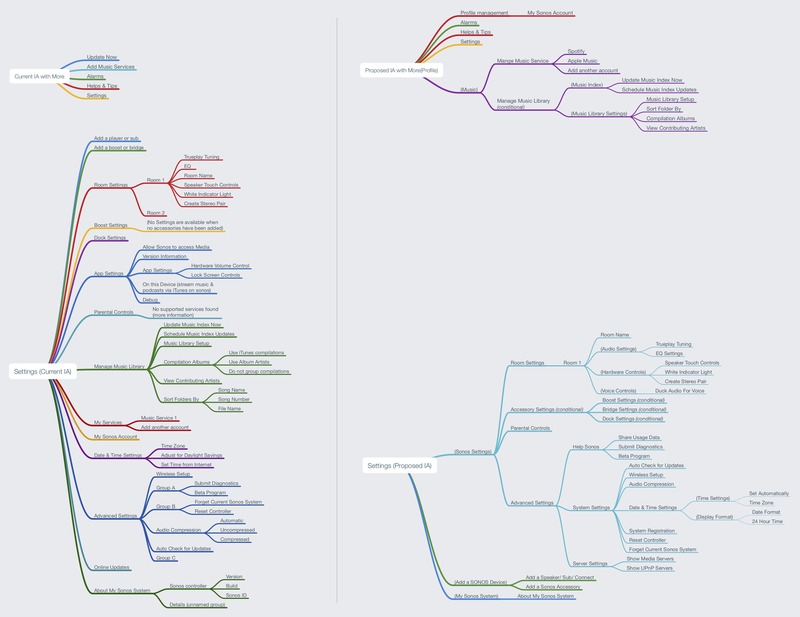 Sometimes it means killing some of your dearest ideas, but it is important to be adaptable and flexible at this stage to make sure the design works best for our users. When in doubt, use data to help make a decision! Quantitative data (users stats, SUS) and qualitative data (usability testing results) are all really helpful in helping to identify what is the best design decision to be made for our users, as they are data obtained from users.